Yellow fever vaccine is recommended for people aged > 9 months who are traveling to or living in areas at risk for yellow fever virus transmission in South America and Africa. Yellow fever vaccine may be required for entry into certain countries. Yellow fever vaccination requirements and recommendations for specific countries are available on the CDC Travelers' Health page. Yellow fever vaccine is available only at designated vaccination centers. Locations of centers are available from your local health department or on CDC's Travelers' Health Yellow Fever Vaccination Clinics page. For most travelers, a single dose of yellow fever vaccine provides long-lasting protection and a booster dose of the vaccine is not needed. However, some travelers may require a booster dose. Also, certain countries might require a booster dose of the vaccine. Visit Travelers' Health for information on specific country requirements. Talk to your healthcare provider to determine if you may need a dose of yellow fever vaccine or a booster dose before your trip to an area at risk for yellow fever. Reactions to yellow fever vaccine are generally mild and include headaches, muscle aches, and low-grade fevers. There have been reports of rare but serious events following yellow fever vaccination. These events include life-threatening allergic reaction, disease affecting the nervous system, and disease affecting certain internal organs. Testing can be performed to look for certain serious adverse events. Talk to your healthcare provider or travel health clinic provider if you have symptoms that concern you following your yellow fever vaccination. To view the CDC's "Frequently Asked Questions" page, click here. Avoid mosquito bites when traveling in tropical areas. 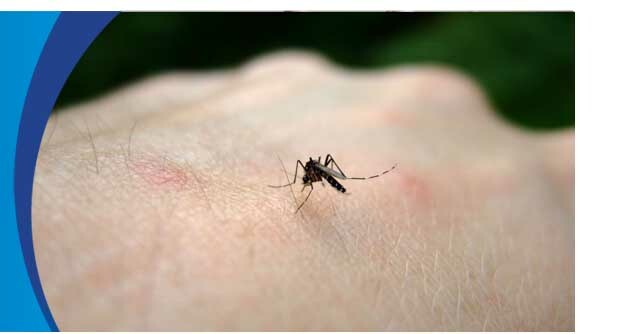 Mosquitoes that spread yellow fever usually bite during the day, especially at dusk and dawn. Wear long-sleeved clothing and long pants. For extra protection, treat clothing with the insecticide permethrin. Use insect repellent on exposed skin. Repellents containing DEET (N,N-diethylmetatoluamide), Picaridin (KBR 3023), IR 3535, p-Menthane 3,8-diole (PMD or oil of lemon eucalyptus) are effective. Follow application instructions carefully. Stay in well-screened areas as much as possible. Spray living and sleeping areas with insecticide. What is the basic yellow fever transmission cycle? * There are two kinds of yellow fever, spread by two different cycles of infection. What type of illness does yellow fever virus cause? * Illness ranges in severity from a self-limited febrile illness to severe hepatitis and hemorrhagic fever. Many yellow fever infections are mild, but the disease can cause severe, life-threatening illness. Symptoms of severe infection are high fever, chills, headache, muscle aches, vomiting, and backache. After a brief recovery period, the infection can lead to shock, bleeding, and kidney and liver failure. Liver failure causes jaundice (yellowing of the skin and the whites of the eyes), which gives yellow fever its name. Severe yellow fever infections can be fatal. * The incubation period (time from infection to illness) is usually 3-6 days. * There is no specific treatment for yellow fever. Treatment is symptomatic-rest, fluids, and ibuprofen, naproxen, acetaminophen, or paracetamol may relieve symptoms of fever and aching. Aspirin should be avoided. Infected persons should be protected from further mosquito exposure (staying indoors and/or under a mosquito net during the first few days of illness) so that they can't contribute to the transmission cycle.